Don’t believe what you read about the benefits of artificial sweeteners. That’s the message from University of Sydney researchers whose recent analysis shows widespread bias – and therefore inaccuracy – in industry-funded research into fake sugars. The review, published in the latest edition of PLOS ONE journal, analysed 31 studies into artificial sweeteners between 1978 and 2014. The studies considered both the potentially beneficial effects of artificial sweeteners, such as weight loss, as well as harmful effects like diabetes. The paper looked at two potential sources of bias 1) who funded the study and 2) who authored the study (and whether they had conflicts of interest due to ties to the sweetener industry. The sweeteners under review were acesulfame potassium (E950), aspartame (E951), salt of aspartame-acesulfame (E962), neotame (E961), saccharin (E954) and sucralose (E955). This is the first major review of the effects of funding bias in nutrition research from the Charles Perkins Centre’s Bias in Research project node, a new research collaboration aimed at improving health policy by encouraging unbiased and evidence-based research. 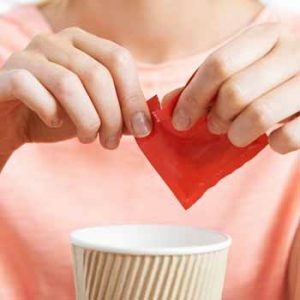 » An alarming new analysis has found that industry influence has skewed research data on artificial sweeteners. » Research with ties – either through funding or author allegiances – to the food industry was many times more likely to report positive benefits from sweeteners – even if the actual study did not show this, and to downplay problems in its conclusions. » This is important because the results of these studies help shape food and health policy and dictate the recommendations made to us about what – and what not – to eat. The researchers began by assessing the relationship between review funding and review results. They found that artificial sweetener industry sponsored reviews were more likely to have favourable results (75% of cases) than non-industry sponsored reviews, including reviews with no funding disclosed (less than 5 % of cases). In terms of the relationship between review sponsorship and review conclusions (that is to say, the summing up at the end of the research paper which is what tends to be reported on), artificial sweetener industry sponsored reviews were more likely to have favourable conclusions (100% of the time) than non-industry sponsored reviews, including reviews with no funding disclosed, (around 65% of the time). “It’s alarming to see how much power the artificial sweetener industry has over the results of its funded research, with not only the data but also the conclusions of these studies emphasising artificial sweeteners’ positive effects while neglecting mention of any drawbacks,” said co-author Professor Lisa Bero , head of the Charles Perkins Centre’s bias node. Reviews performed by authors with a conflict of interest with the food industry were also more likely to report unclear results (50% of the time) than those performed by authors without conflicts of interest (12.5% of the time). Furthermore, the review states that 42% of authors had conflicts of interest that were not disclosed in the published paper. The review also claims that reviews published in journals funded partially or in full by the food industry more often have conclusions that are favourable towards artificially sweetened beverages than reviews published in non-industry funded journals. The study, published the same week that research from Johns Hopkins Bloomberg School of Public Health and the University of California San Francisco revealed that the sugar industry has paid for influential research in the 1960s to downplay the link between sugar and coronary heart disease and instead point the finger at fat. That shocking review of the historical documents, published in JAMA, raises serious questions over the legitimacy of industry-funded scientific research, and suggests that national dietary guidelines over the past 50 years have been based on skewed science.